One morning in 1805, off a remote island in the South Pacific, Captain Amasa Delano, a New England seal hunter, climbed aboard a distressed Spanish ship carrying scores of West Africans he thought were slaves. They weren't. Having earlier seized control of the vessel and slaughtered most of the crew, they were staging an elaborate ruse, acting as if they were humble servants. When Delano, an idealistic, anti-slavery republican, finally realized the deception, he responded with explosive violence. Drawing on research on four continents, The Empire of Necessity explores the multiple forces that culminated in this extraordinary event—an event that already inspired Herman Melville's masterpiece Benito Cereno. 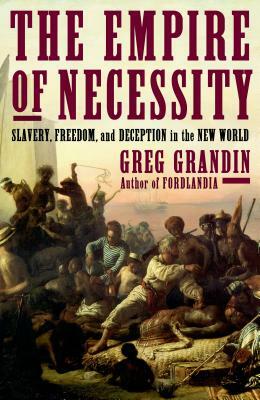 Now historian Greg Grandin, with the gripping storytelling that was praised in Fordlandia, uses the dramatic happenings of that day to map a new transnational history of slavery in the Americas, capturing the clash of peoples, economies, and faiths that was the New World in the early 1800s. Greg Grandin is the author of Fordlandia, a finalist for the Pulitzer Prize, the National Book Award, and the National Book Critics Circle Award. A Professor of History at New York University, Grandin has published a number of other widely-acclaimed books, including Empire's Workshop, Kissinger's Shadow, and The Empire of Necessity, which won the Bancroft Prize. “Elegant . . . a wonder of power, precision and sheer reading pleasure . . . Grandin takes readers on a tour of the hell of the slave trade, a tour so revelatory and compelling, we readers, unlike Captain Delano, can't fail to see the truth before our eyes.” —Maureen Corrigan, NPR's "Fresh Air"